From the label’s humble beginnings in a rundown London warehouse to its ascendance as a barrier-breaking cultural entity boasting over 15,000 titles in its catalog, Trojan Records has played an invaluable role in establishing reggae as an essential thread within the fabric of popular music. Founded in 1968 when the reggae genre was virtually unknown beyond its Jamaica birthplace, Trojan Records issued thousands of singles and albums from Jamaica and England’s most successful reggae artists and producers, which were enthusiastically received by Caribbean immigrants living in England, as well as skinheads, punk rockers and eventually, the wider music loving population. 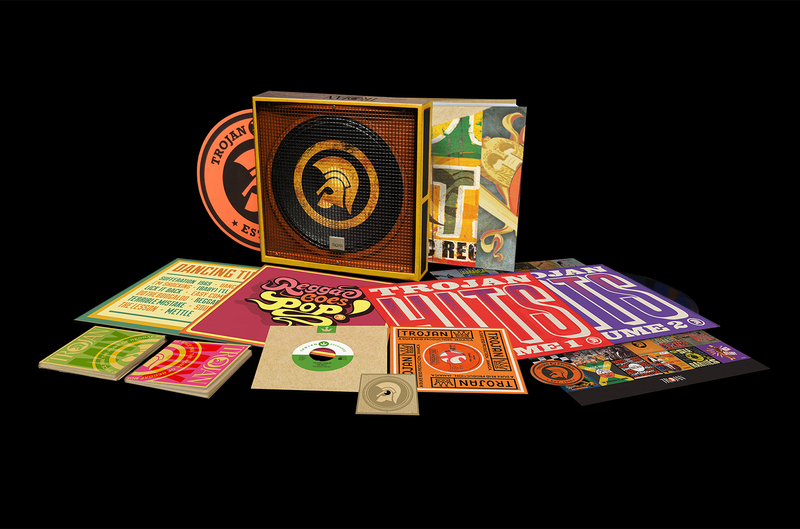 In celebration of their golden anniversary on July 27, Trojan Records released an impressively packaged multi-format box set. Included are various memorabilia (a poster, wooden 7″ single adapter, turntable mat); a coffee table book, Trojan: Art of the Album, featuring full scale reproductions of 50 of the label’s most memorable album covers, written by label manager and longstanding Trojan archivist/historian, Laurence Cane-Honeysett; two 3 CD sets, Trojan Mix of Rare and Unreleased Tracks, Labels and Hitmakers and Trojan Mix of Hits, Boss Sounds, Roots & Dub, Original Dancehall, with half of the 141 tracks appearing for the first time on CD. Four vinyl albums are a part of the box set, too: Trojan Hits Volumes 1 and 2, Dancing Time and Reggae Goes Pop, collections of major U.K. hits and Jamaican best-sellers alongside rare releases, encompassing Jamaica’s rocksteady, reggae, dub and dancehall genres. Laurence Cane-Honeysett also penned The Story of Trojan Records (BMG Books/Eye Books) a comprehensive history of the label’s development over the past half century, sold separately from the box set and available in the U.S. on Oct. 1. Additionally, Cane-Honeysett curated the Trojan box set’s musical selections. Meticulously researched, the collection strikes an appealing balance between the label’s biggest hits and its lesser-known gems: landmark singles by Jamaican music legends Bob Andy (“Fire Burning”), Dennis Brown (“Money In My Pocket”) and Sugar Minott (“Ghetto-ology”) appear alongside such curiosities as the laugh inducing “Hysteriacide” by (the late) Count Prince Miller. “We wanted to do something very special for the 50th anniversary and finding unreleased tracks is an angle many people take. Whereas the new listeners want the hits, the long-time collectors want the rarities, so we had to tick both boxes,” Cane-Honeysett told Billboard in a Skype call from his London home. “We’ve included novelty songs so not all of it is amazing reggae. Some might say ‘Hysteriacide’ is an awful song but it’s there to reflect everything Trojan did to get the music out there.” Also featured are the various Trojan subsidiary labels (approximately 30, says Cane-Honeysett) created for individual producers such as Lee “Scratch” Perry’s Upsetter, Bunny Lee’s Jackpot and Gayfeet/High Note for the lone female, Sonia Pottinger. “The Trojan 50th box set is a grand, befitting presentation for Jamaican music because Trojan Records was the single most important reggae record label in England and perhaps they still are,” comments renowned British reggae radio personality/selector David Rodigan, whose radio programs were also pivotal in expanding the music’s reach. Rodigan spoke to Billboard following his 40th anniversary performance at Spain’s Rototom Sunsplash with the 25-piece Outlook Orchestra, who played elegant, symphonic arrangements of Rodigan’s favorite Jamaican singles, many of them Trojan releases. “Trojan didn’t really sign and develop acts, they licensed tracks from producers and artists, making thousands of great Jamaican records available to the U.K. population. They have an incredible back catalog, anyone can learn a lot about reggae from their compilations. Without Trojan Records it would have been a completely different landscape for reggae music,” adds Rodigan. In July 1967, Chris Blackwell’s Island Records created an imprint, Trojan, specifically to release productions by Jamaica’s Arthur “Duke” Reid. 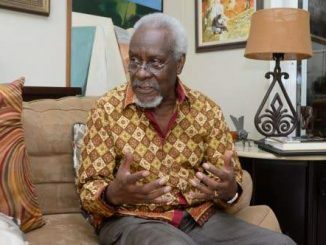 Reid, known as The Trojan (the name of the British made flatbed truck used to carry Reid’s sound system, also called The Trojan), was among the first sound system owners to start producing his own music; his innovative, beautifully crafted productions dominated Jamaica’s rock steady era, 1966-1968. Reid’s hits included The Paragons’ “The Tide Is High”, which was covered by Blondie in 1980, and reached No. 1 on the Billboard Hot 100. Despite Reid’s successful run in Jamaica, the U.K. subsidiary created for his music folded before the end of 1967. 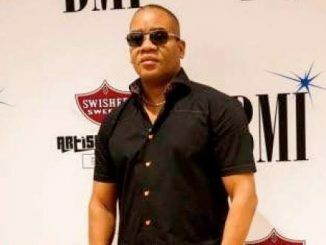 The following year, Blackwell decided to combine Island’s Jamaican music catalog with the distribution company Beat & Commercial (B&C), run by accountant Lee Gopthal, a Jamaican expat. The name chosen for the B&C/Island endeavor was Trojan Records. 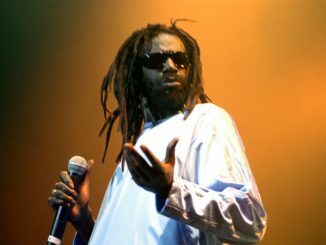 The earliest releases for Trojan’s second manifestation were by Jamaica born, London based artist/producer Dandy Livingstone, whose efforts were essential to Trojan’s growth. Born Robert Livingstone Thompson, Dandy also released music as The Brother Dan All Stars. The Trojan subsidiaries Down Town and J-Dan Records were established to facilitate Dandy’s output, which included Trojan’s very first long-playing release Dandy Returns. Dandy’s 1969 production, a reggae adaptation of Neil Diamond’s “Red Red Wine” by singer Tony Tribe, gave Trojan its first mainstream U.K. chart entry. More national chart hits followed for Trojan in 1969 including Jimmy Cliff’s “Wonderful World, Beautiful People,” Harry J All Stars’ “The Liquidator” and The Upsetters’ “Return of Django.” Trojan attained even greater success that year with the introduction of their budget compilation Tighten Up, an album of popular hits for the price of two singles. In 1971 Trojan scored their first U.K. No. 1 with Dave and Ansell Collins’ lively instrumental “Double Barrel.” Trojan’s consistent chart placements, unprecedented achievements for a Jamaican music focused label, introduced rock steady and reggae to thousands of listeners and worked hard to take the music into the mainstream. “Trojan serviced the major sound systems, reggae clubs and pirate radio stations via their Musicland and Muzik City record shops, which were key to the company’s early success, as radio play remained a challenge,” explains Cane-Honeysett. “The BBC, which had a monopoly on airplay at the time, considered reggae poorly produced ethnic music; only occasionally, very late at night, would those early records be played. Most of the UK shops that sold reggae records didn’t register with the charts, so no one really knew how many records were selling. It’s only when they began moving huge numbers, and major record stores began stocking these releases, that the BBC, grudgingly, recognized and began playing this music.” In an attempt to make the music more radio friendly, Trojan overdubbed strings onto some of the master recordings. Among the most successful of these experiments were Bob Andy and Marcia Griffiths’ inspirational cover of the Nina Simone classic “Young, Gifted and Black,” which reached No. 5 on the British charts in 1970. That same year, Trojan issued Soul Rebels, Bob Marley and The Wailers’ first album released outside of Jamaica. Now regarded as a masterpiece by Marley, Bunny Wailer and Peter Tosh, the Lee “Scratch” Perry-produced Soul Rebels received a tepid response upon its initial release. By 1972, Blackwell withdrew Island Records’ interest in Trojan. 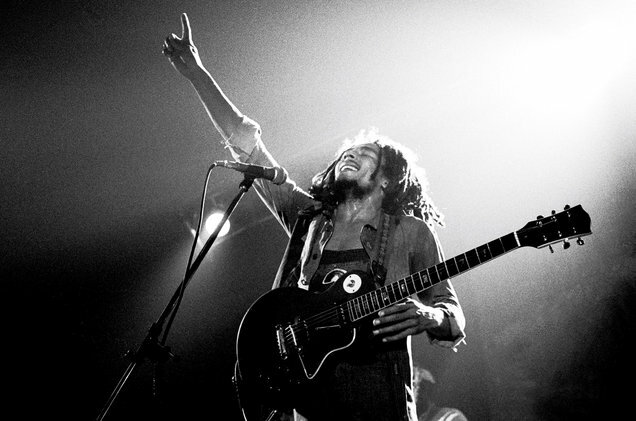 Island went on to have great success with reggae releases later in the decade, most notably with Bob Marley, a triumph partially attributable to the foundation laid for the music’s acceptance through Trojan’s pioneering efforts. Trojan’s initial growth was buoyed by the embrace of white working-class youths known as skinheads, who were attracted to Jamaica’s upbeat sound and rebellious spirit, and Caribbean expats who had migrated to England. However, something far more significant than increasing record sales was taking place. In a recent interview with Billboard in midtown Manhattan, Don Letts — BBC radio host, founding member of Big Audio Dynamite and a Grammy-winning filmmaker (for Westway to the World, a documentary about legendary punk band The Clash) — recalled Trojan Records’ emergence at a time of escalating racial tensions in England. ​Letts, the son of Jamaican parents who relocated to England in 1955, remembers a 1968 speech given by conservative Parliament Member Enoch Powell. In his divisive Rivers of Blood speech Powell strongly criticized mass immigration into England and proposed sending home the immigrants who were already there. Letts is one of the interviewees in the forthcoming documentary, Rudeboy: The Story of Trojan Records, (BMG/Pulse Films), which will premiere on Oct. 12 as part of the British Film Institute’s London Film Festival; the U.S. release date/format roll out are still being negotiated. Directed by Nicolas Jack Davies, Rudeboy features artists, producers, sound system selectors and Trojan staff commenting on the label’s development, juxtaposed with reenactments of significant events between 1968-1975, Trojan’s heyday, when the label achieved 35 national hits in the U.K. Gopthal, who passed away in 1997, sold Trojan in 1975; the label has changed hands five times since then, with BMG purchasing the Trojan from Universal Music Group in 2013. “Because there’s so little footage or even photos from the ’60s and ’70s, whether in England or Jamaica, Pulse Films recreated the footage that they didn’t have,” shares Max Norlin, marketing manager of Trojan Records.